Patients with ventral hernia and loss of domain represent some of the most complex hernia a surgeon may face. Loss of domain is where 50 % of the abdominal viscera reside outside the abdominal cavity. Emergency surgery with open abdomen management and morbid obesity with prior open abdominal surgery are the two most common reasons for loss of domain development. 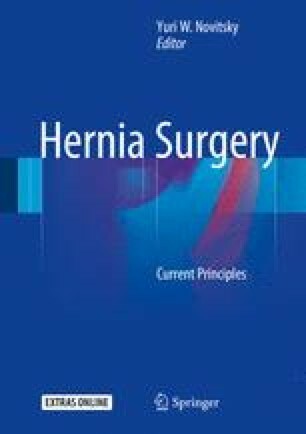 Restoring abdominal wall integrity and function via a hernia repair poses special consideration from a preoperative preparation and operative technique standpoint. Preoperative weight loss may decrease the intra-abdominal volume for the viscera to return at the time of the repair. Smoking cessation, wound care, exercise training, and diabetes management can reduce postoperative pulmonary and wound infections. In most cases, myofascial releases that lengthen the abdominal wall are necessary to optimized primary fascial closure of the abdomen. There are multiple surgical techniques that can be combined to enhance mesh implantation and restoration of abdominal wall function.